I’ve been playing lately with generative art and with this project I wanted to do something that’s more interactive. 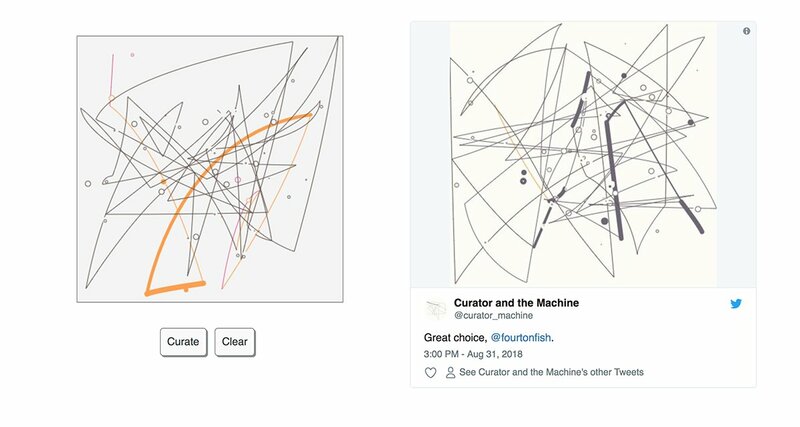 I took the code behind pollock.exe and made a page where you can tell a bot when it should tweet the artwork. The algorithm (or “the machine”) generates a “painting”, and you, the “curator” decide when it’s finished and should be shared. Or you can scrap it and start over. I made this as a fun little side project, but I think it does pose some good questions about creativity, and shows how machines and people can work together to create something. And I specifically used Glitch as it lets anyone take the source code and remix it. I thought about variations on the idea, for example, maybe the curators should be working with the same exact “painting” (right now, every person sees their unique artwork), so I might explore those ideas later, or maybe someone else will.